Melton Mowbray Tennis Club came out on top of the County Awards night for the second successive year. Three days after the ladies’ first team were presented with the Team of the Year award at the Melton Times Sports Awards, the club attended the county presentations. 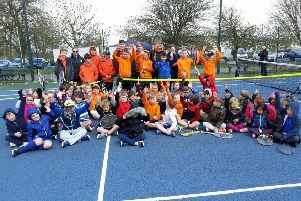 Despite having completed only their second season at Melton Council’s Sports Village courts, they finished as the most successful club of the year, collecting 11 titles. Federation Cup captain Anne Keothavong, fresh from the British ladies’ team’s success at Bath, was special guest and talked about her own start in tennis and her achievements during a question and answer session with Leicestershire President and former British number one Mark Cox. Anne was also on hand to present all of the awards in front of a 300-plus audience. Melton titles – Summer: Men’s Division One; Men’s Division 4A; Ladies’ Division 1. Winter: Men’s Division Three; Men’s Division Nine; Men’s Division Two (team tennis); Ladies’ Division One; Ladies’ Division Seven. Mixed: Division One; Division 3B. There is little down time for the club as they are already competing in the Indoor League, with the Summer League season starting next month. With many of the club teams gaining promotion last year, this coming season is expected to be even tougher, but club chairman Nigel Haynes is delighted with the Melton’s successes and believes the young players will represent the club with distinction. Following positive meetings with the council Nigel is also hoping for some good news over the possible resurfacing of the worn-out courts which the club believes are becoming dangerous.